Boston Bruins forward David Pastrnak spoke publicly Monday for the first time since injuring his thumb at a team event on Feb. 10. 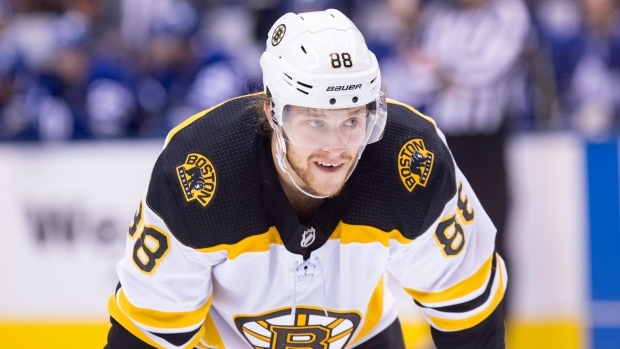 Pastrnak, who could return Tuesday after missing the past 16 games, said that the injury, which required surgery, was avoidable. "I let the guys down a bit," Pastrnak said, per NHL.com. "Obviously it's tough time, you know? It's not an injury that happened on the ice. I took full responsibility for that and obviously that's what hurt me most. Could I avoid it? Obviously, I wish and I think these things happen. But definitely the thing that I could let somebody down, I hate that. The first couple of weeks was tough." The 22-year-old has 31 goals and 66 points in 56 games this season. He confirmed that the injury occurred as he walking out of the team event. "On my way to the car, I slipped and I fell," said Pastrnak. "It was unfortunate that I got hurt from it. I was really upset. It would be the last thing I wanted to do. Four weeks in the gym, skating with no stick. Obviously, these things happen in life and I just try to take advantage and get better as a player." "I'm a lefty, so I usually put my left hand always first," he continued. "Put all the weight on it. Maybe if that happened when I was 18 with 160 [pounds], that wouldn't hurt. But now I'm 190. Kind of hurt." Pastrnak will continue to wear a splint on his thumb when he returns. He said it won’t affect his shooting but could make stickhandling more difficult. Bruins head coach Bruce Cassidy confirmed Monday that Pastrnak will return to the team's top line with Brad Marchand and Patrice Bergeron when he's cleared. Cassidy did, however, leave the door open to making changes to the team's lineup before the playoffs. "That's where he's going to start," Cassidy said. "It's a comfort level for him. And then we'll see." The Bruins are 13-3-1 since Pastrnak was injured and visit the New York Islanders on Tuesday night.